Join the SaverNation program and make your everyday purchases of travel, music, office supplies, apparel, electronics, concert tickets and more from participating merchants. Nearly every national brand participates and gives you 1-15% cash back for your online purchases. 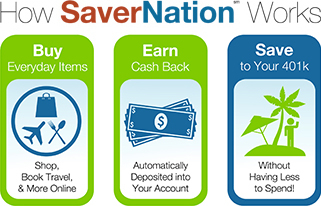 SaverNation’s patent-pending technology automatically converts your cash back into extra pre-tax plan contributions or deposits it into the account of your choice.